An annual report is an in-depth, comprehensive report that provides an overview of a business’s achievements and key metrics from the preceding year. 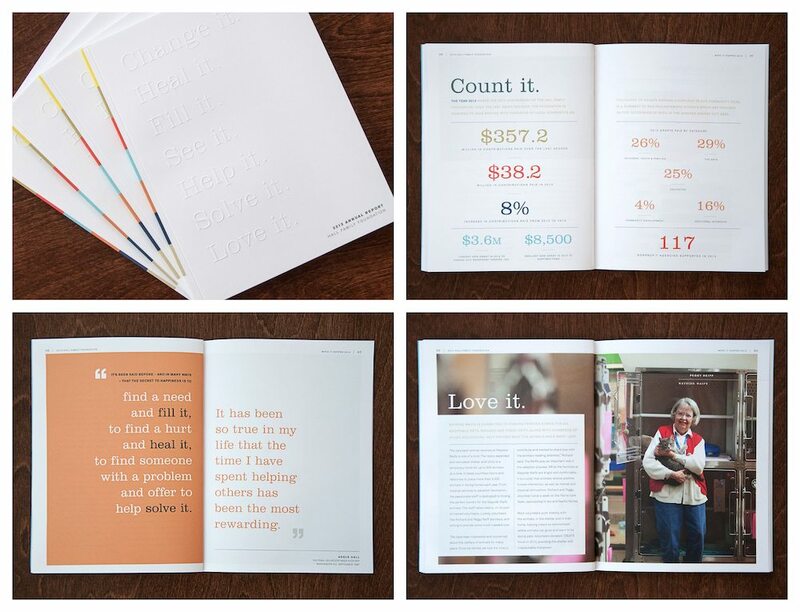 Think of it this way: an annual report is a perfect opportunity to tell your business’s story. 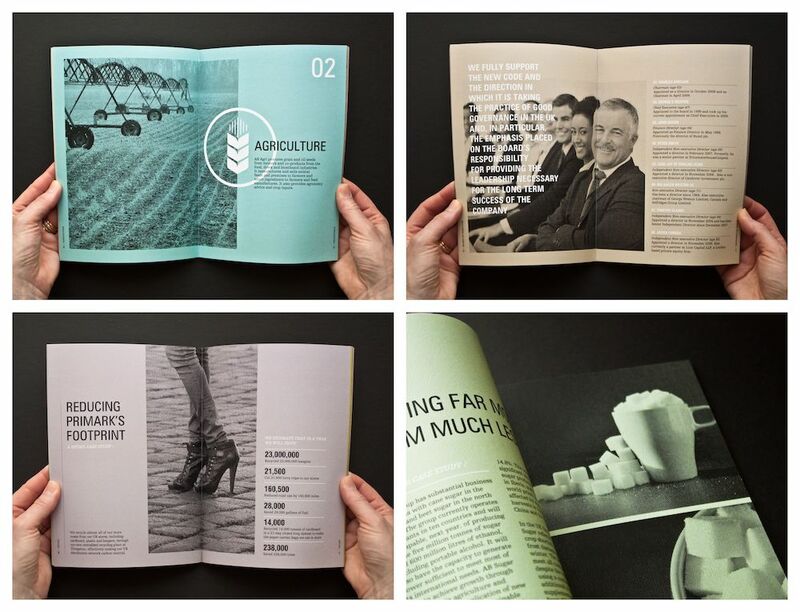 Your annual report design can help you tell that story. A lot of that may sound like dry information…but it doesn’t have to be. 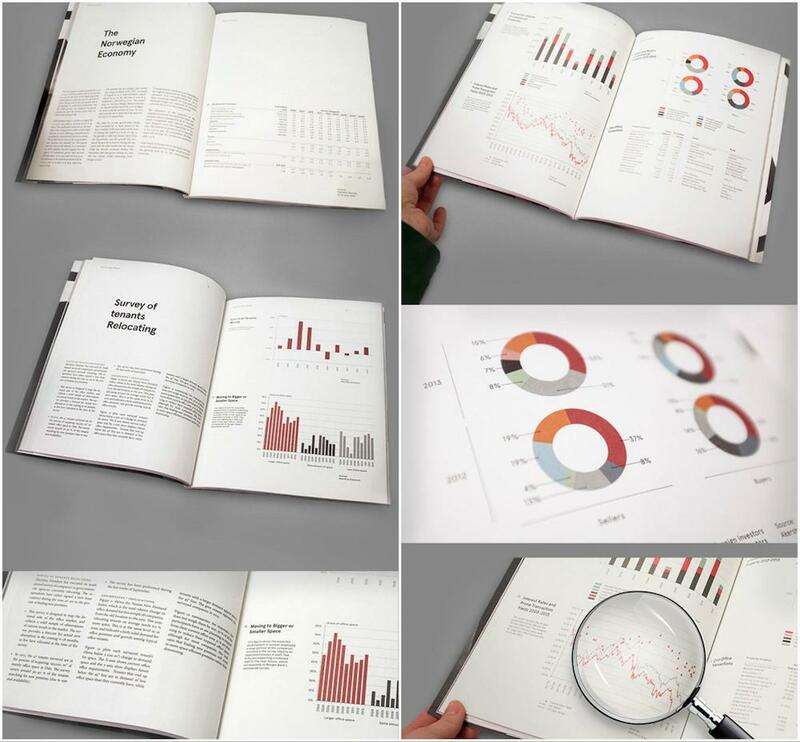 If your annual report is visually-engaging, it will grab the attention of readers and hold it. 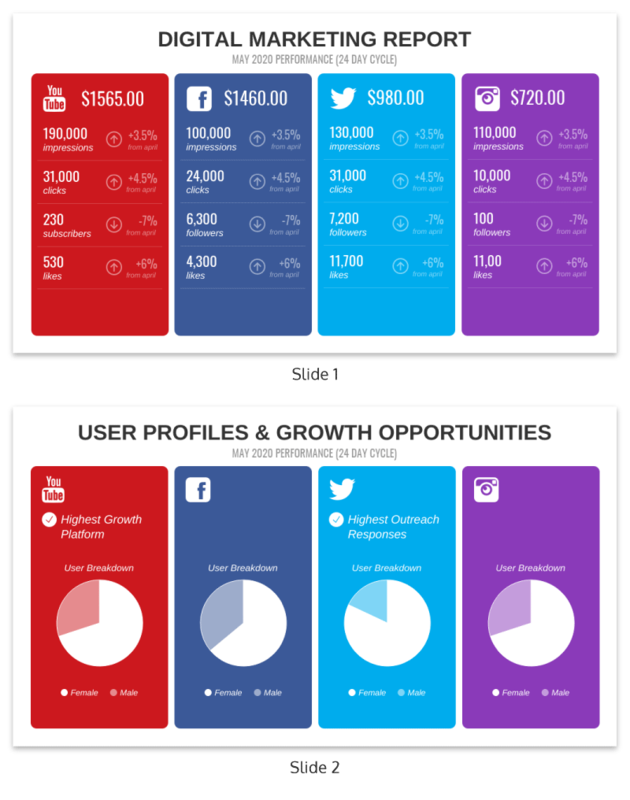 You can visualize data, include your branding, and incorporate your team’s personality into the design. 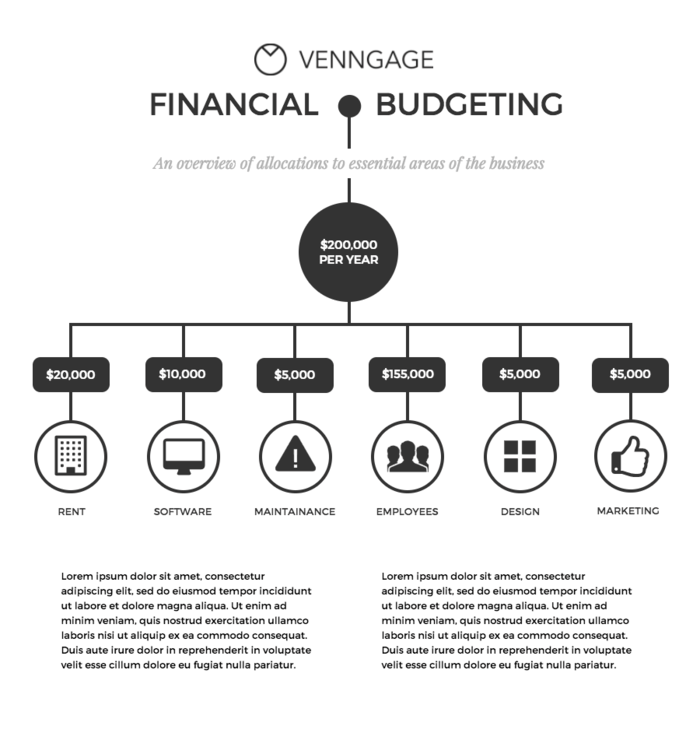 But what if you’re a small business or organization with a limited budget for design? 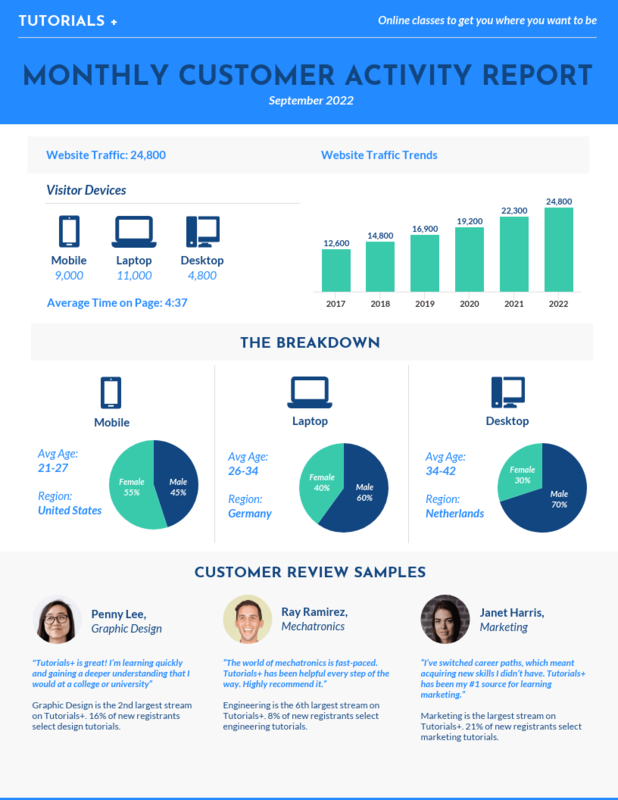 You don’t need to be a trained graphic designer to create a memorable report! 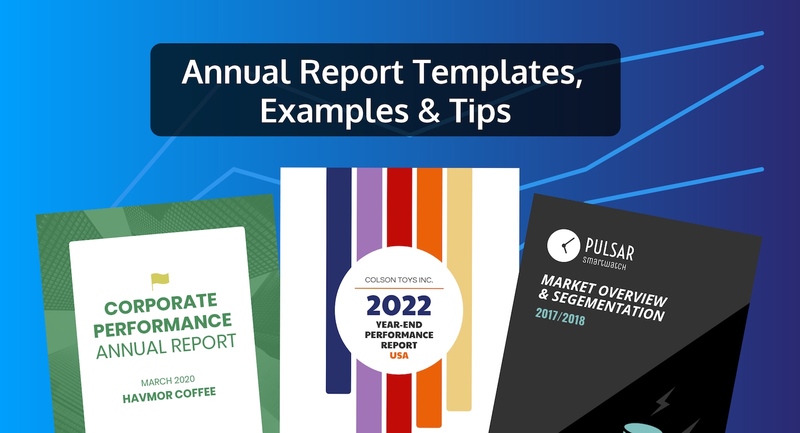 Use an annual report template as the framework and incorporate your own information, visuals, color schemes, fonts and more. Plus, check out our post on report design best practices in 2019 for even more tips. 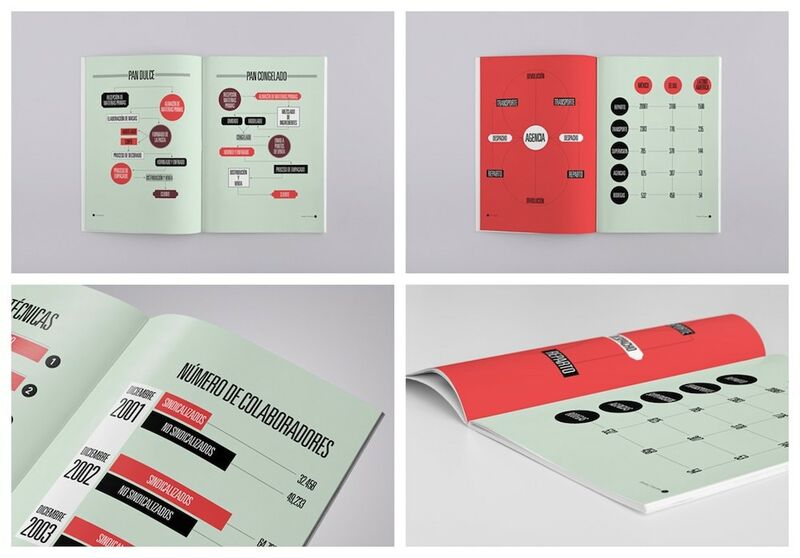 Here are over 55 annual report design templates you can use now to create an engaging report. What overarching-theme would you give the past year? What was your business or organization’s greatest achievement? 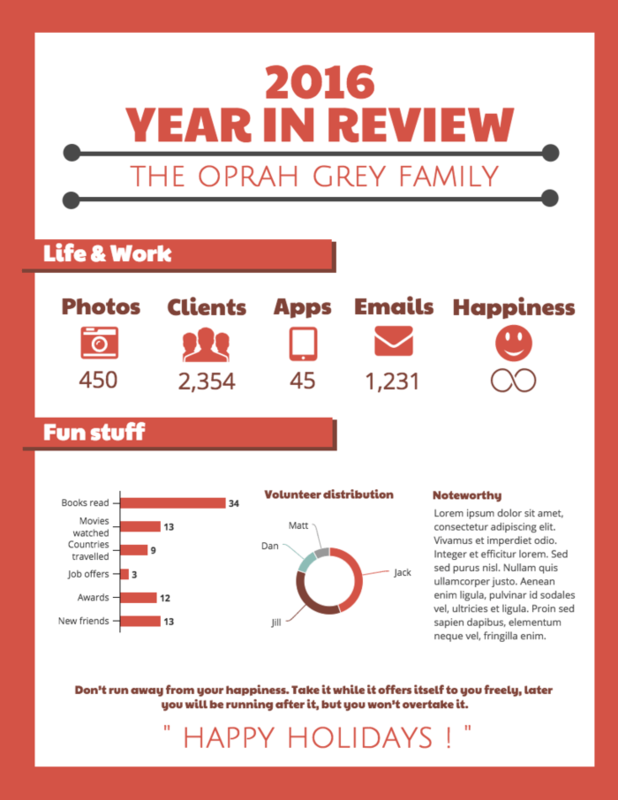 Create an annual report cover that reflects that theme. Right off the bat, readers will get a sense of the story you’re about to tell. The cover design will prime them for the rest of the information to come. For example, this annual report template uses a shoreline theme in the cover. The imagery of the horizon creates a sense of opportunity and goal-setting. 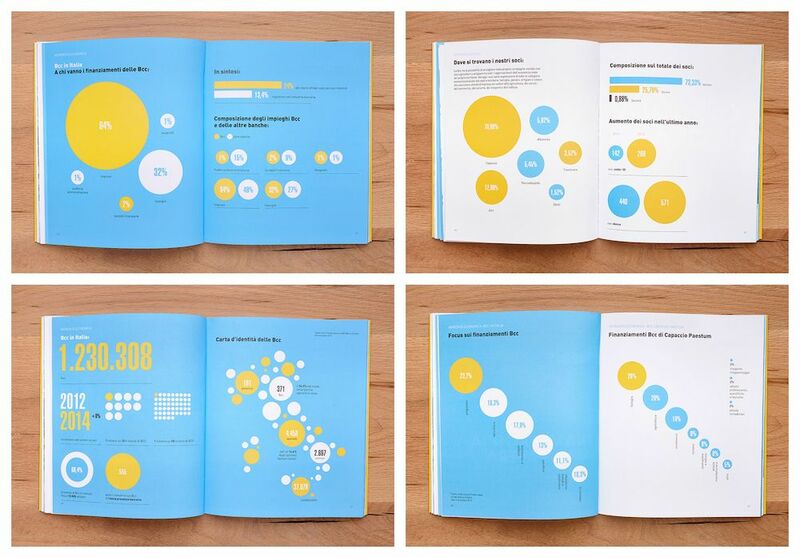 Often enough, what an annual report design is missing most is some color. Pick a bright color–it could be your brand colors, or a color that reflects the theme or “mood” of your annual report–and use that as the page background. You can use white boxes on top to ensure that your text stands out. For a more minimalist annual report design, use a neutral background and use bright accent colors to highlight important information. For example, you could use color to highlight keywords, key data points, and header text. Many companies hold a year-end meeting to go over key metrics, achievements and goals. Create a slick presentation that will hold your team’s attention. Part of creating an effective slide for your annual report presentation is finding the right balance between text and imagery. Drawing an invisible “line” down the middle of your slide is an easy way to guide your design. In each section of your annual report, you’re introducing a new topic. To help introduce the new section, use a decorative section header that illustrates the topic of the section. If you want to emphasize certain pieces of information or break up an expanse of text on your page, color blocks are an easy fix. Pick a neutral color that will allow text to stand out, like grey or a light shade. Typically, you’re trying to pack a lot of information into your annual report. 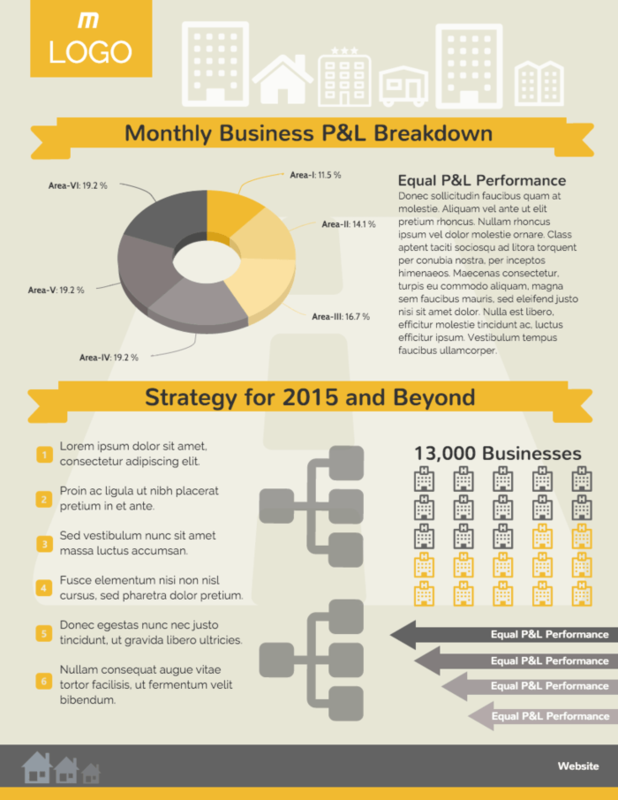 The readability of your annual report will have a lot to do with the design. Color coding your information is a simple way to offer visual cues for readers to follow. Pick colors that have a logical association with the information. In order for your employee reviews to be consistent and fair across the board, you need to follow a structure. That’s why it’s a good idea to use an employee review template. When it comes to keeping readers engaged with longer documents like an annual report, variety is key. 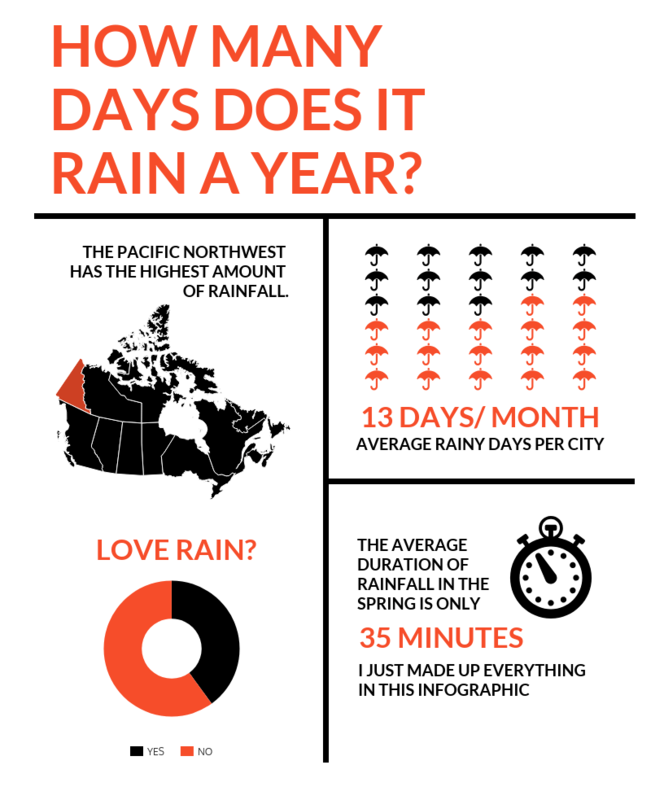 Use many different kinds of charts, infographics, and illustrations to show your data. For a more in-depth guide to picking the best charts for your data, click here. 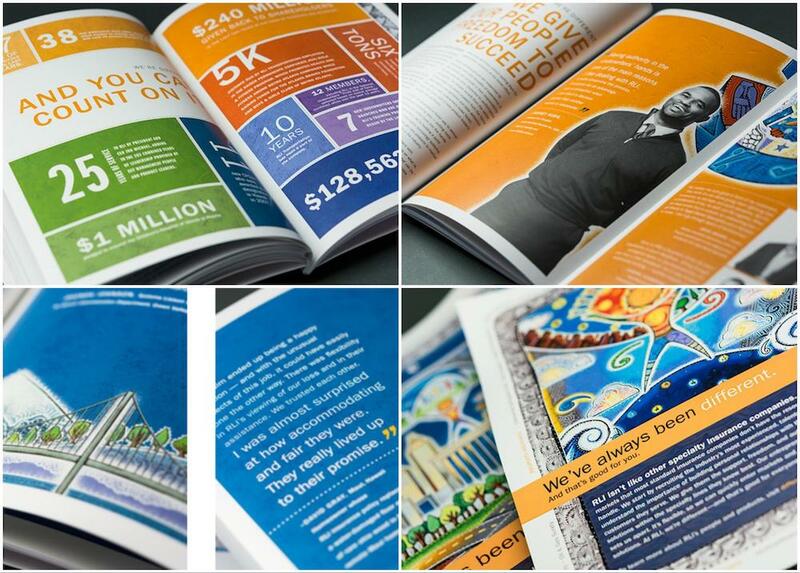 If one of the pillars of your business is creativity, reflect that in your annual report design. Play around with unusual page layouts and surprising design elements. Our post on presentation layout ideas should help spark your creativity. 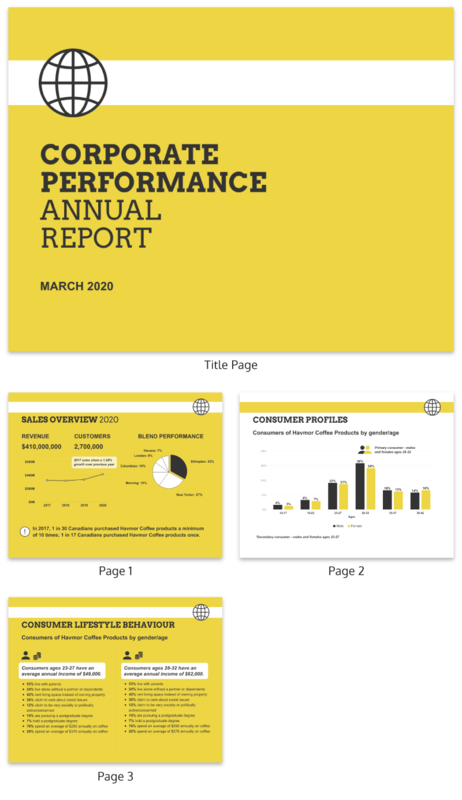 Take this annual report template that follows a zig-zag path and uses circles to present data in a quirky way. Pair dark colors with bright colors for a bold design. Not only do contrasting colors look good, they can also help you highlight important information. For example, showing an important statistic in a bolder font than the other text on the page will help it to immediately jump out at readers. Icons are the perfect way to visualize ideas and highlight points. 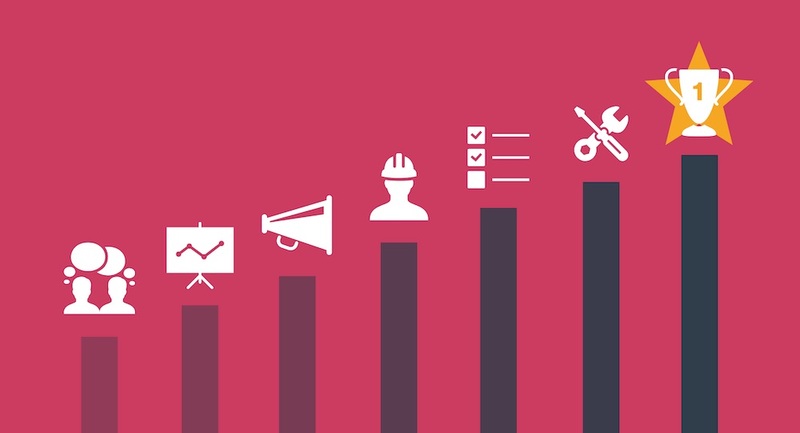 You can use icons to emphasize specific points on a chart, or to draw attention to important text. 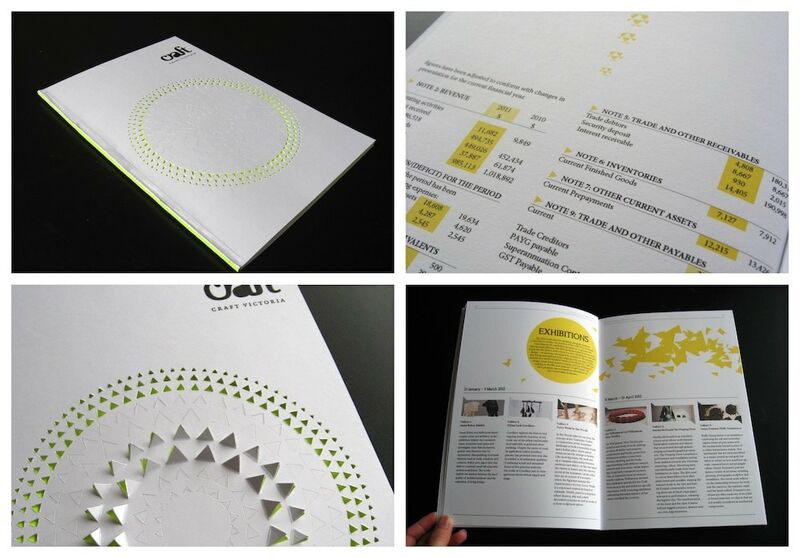 Since your annual report tells the story of your company, make sure that the design reflects your brand’s personality. That can mean more than just incorporating your brand colors. Use font styles and images that reflect your brand’s personality. Using the same annual report example from the Croatian Post, you can see how big data visualizations can make your annual report just that much more engaging. If you have a particularly important set of data, like your company’s financial growth over the past year, you can feature that in a creative data visualization. This is an opportunity to incorporate engaging design elements like icons, pictograms, image frames, and bold color schemes. You don’t have to use neutral colors or corporate blue just because everyone else is. Show how unique your business is by using a bright, bold color scheme in your annual report. Was your team’s main goal this year to reach for the stars? Did you turn your small team into a village? You can use images in your design to symbolically reflect those themes. Click here for 35+ simple background images to add impact to your report. A well-designed chart can communicate information in five seconds or less. If you have a lot of data to report for this year, let data drive your design by incorporating plenty of simple but effective charts. 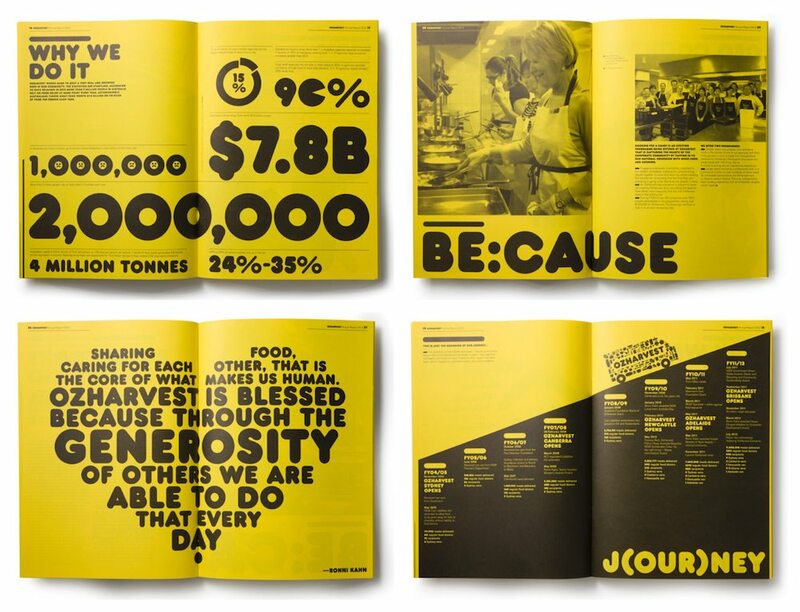 OzHarvest is a non-profit that redistributes food to charities from restaurants and the like. 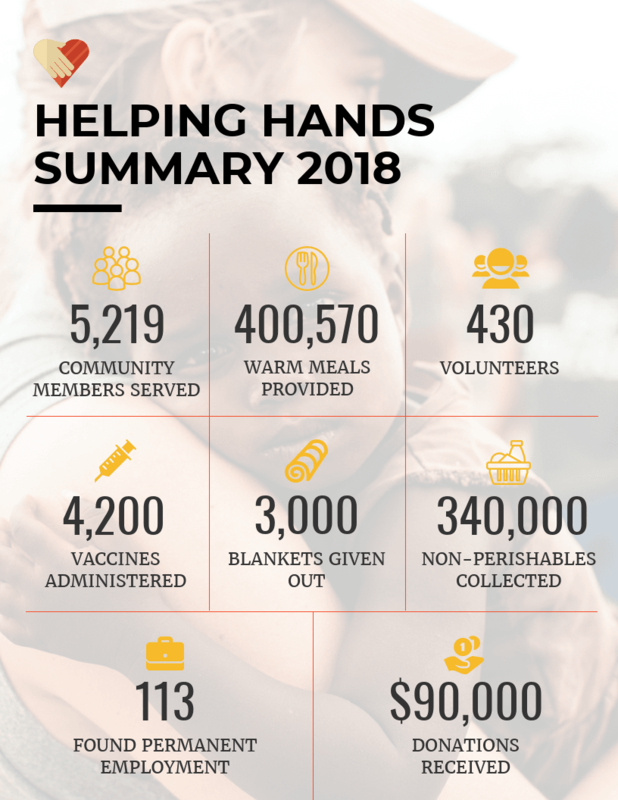 They wanted to make sure their shareholders saw key numbers like how many meals saved, their core message and their mission. By using big fonts and creative visuals like word clouds and charts, they are able to bring that key information forward. This is a good lesson in not being afraid to take up lots of space on a page. If you are struggling to start creating your own annual report template, try looking at some of the themes that run throughout your company’s mission, product and culture. The designers at the Hall Family Foundation used their volunteers as inspiration. Most of these people are the lifeblood of any non-profit so it made a lot of sense to start there! They focused on a handful of action words that helped describe what these volunteers actually do. As you can see, a visual theme was created from those words that are featured on nearly every page. Additionally, the annual report has these words printed on the cover, so the reader notices the theme from the beginning. 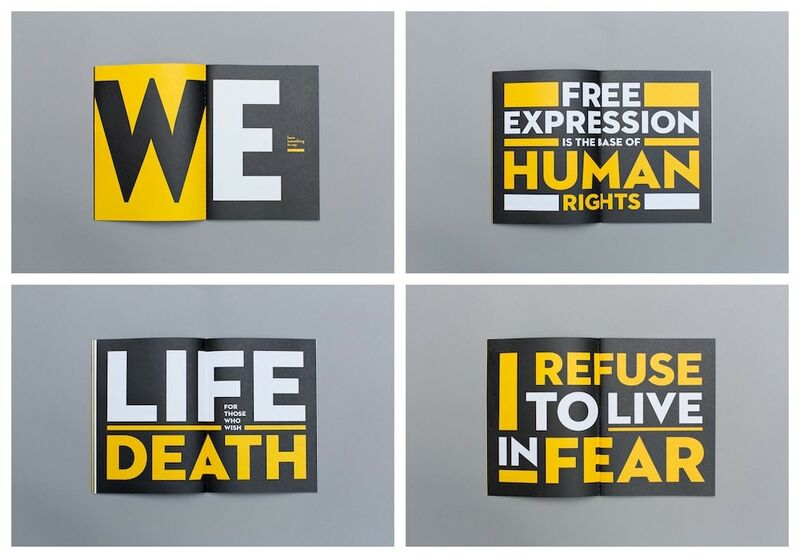 This is a great way to introduce readers to your company or organization’s values. Consistent branding across all of your communications is important. One way that you can ensure this is by using not only your company colors but also colors that communicate the “feel” of your company or organization. 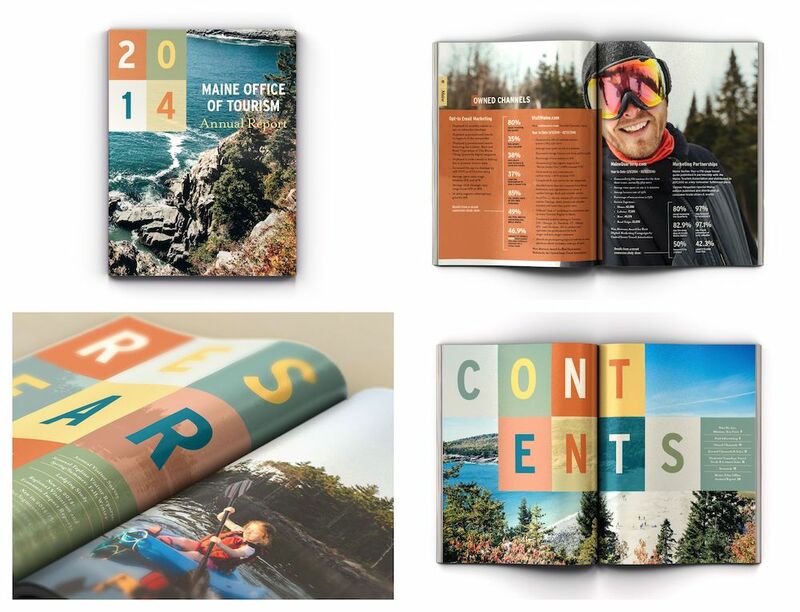 For example, this annual report example from Maine Tourism uses a ton of colors you would see in nature. If you haven’t been to Maine, the outdoors is a pretty big part of their identity. All over this annual report, you can see natural colors in the greens and browns, but also the orange in lifejackets and fires, or the blues in lakes and the Maine sky. While your full annual report may be pages and pages long, a one-pager than summarizes key information is a great accompaniment to create. Pull the most important or noteworthy information and make that the focus of your one-pager. Flow charts are perfect for visualizing processes, timelines, and connections between information. Simple flow charts can be used in a presentation slide, while more complex ones can take up one (or even several!) pages. While photos certainly add to your annual report’s story, they can also distract from the text on the page. But if you use grayscale images or images with a color overlay, they can integrate much more seamlessly into the design of the page. 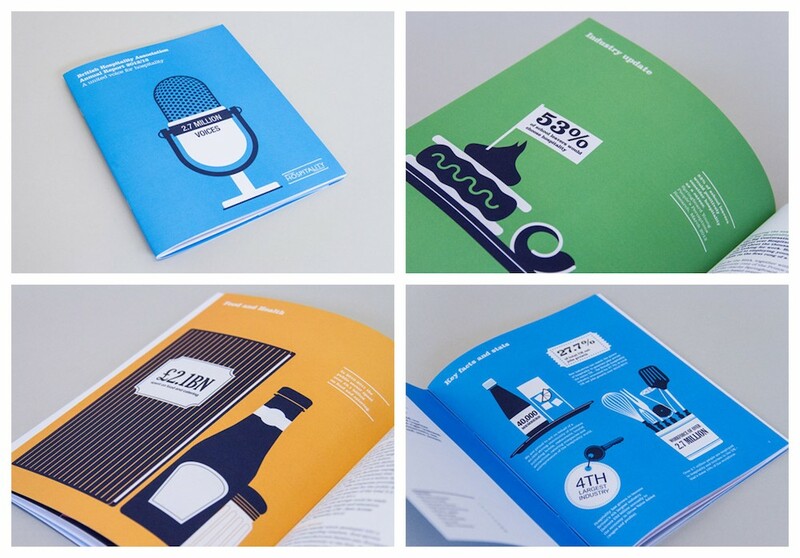 Take a look at how the Associated British Foods’ annual report integrates images into their pages. Pictograms use icons to represent units of data. They’re a fun, creative and different from your standard chart. Pick icons that reflect the theme of the data you’re visualizing. If you want to separate your page into sections, using colored headers is an easy way to do this. Just draw a block line across the page to help your header pop. 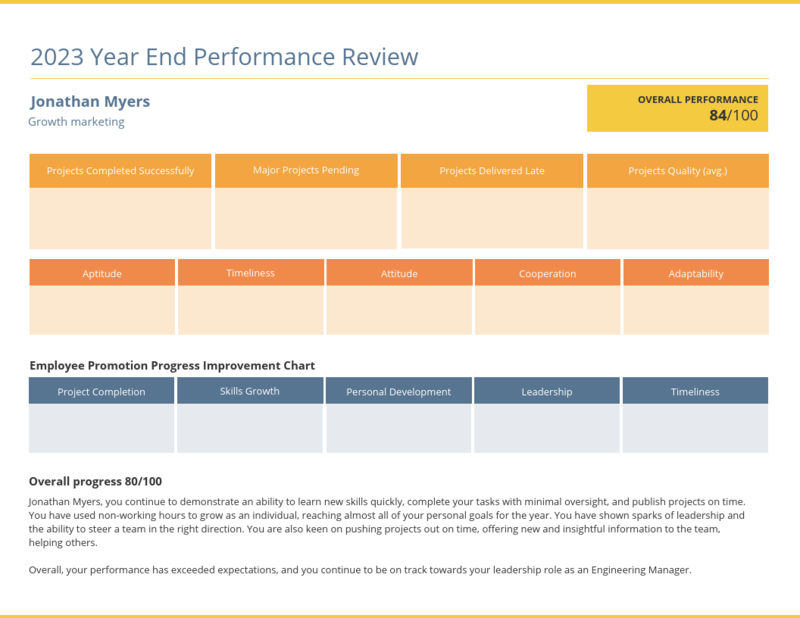 You could even color code your headers to make your annual report page more readable. Forgetting to label your charts is a common mistake that many writers make. But forgetting to label your charts can make your information confusing or misleading. The designers at Capaccio Paestum avoided this trap by labeling all of their bubble charts and bar graphs. Additionally, when you use labels like they did, it helps even the newest stakeholder understand them in seconds. 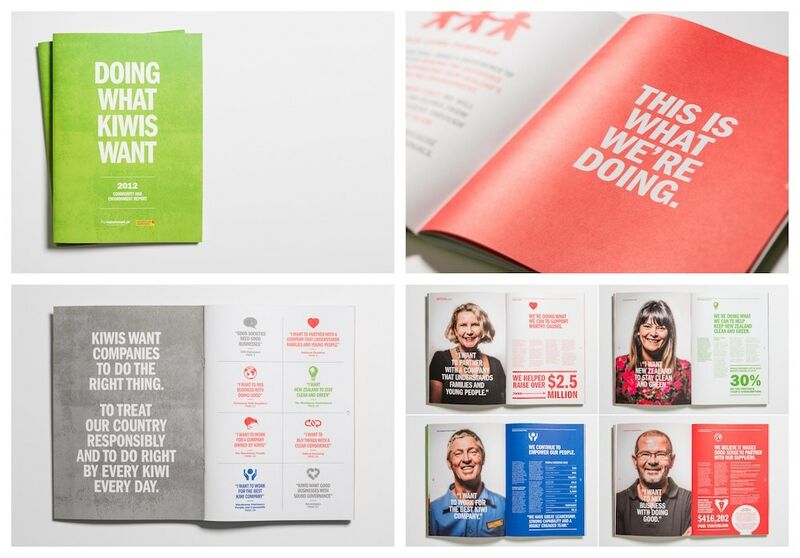 If you want to create a memorable annual report you may need to change the way people look at things. 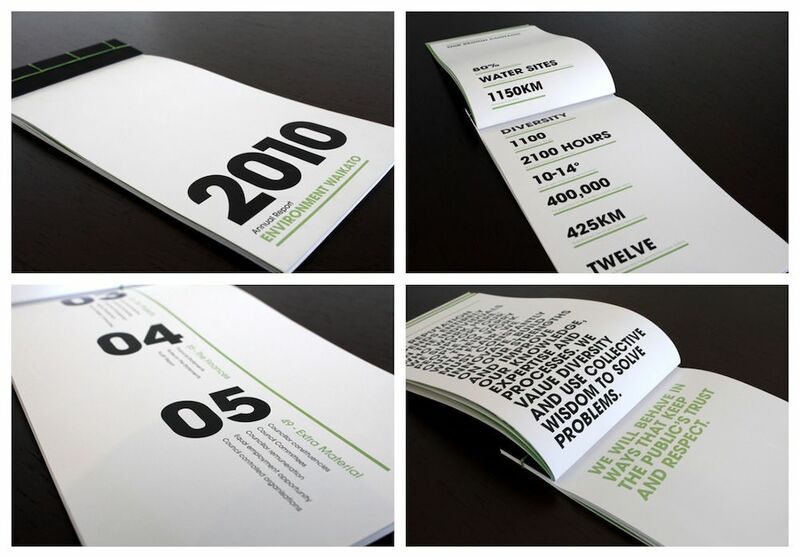 Or in this case, they did it by physically changing the way the annual report was laid out. As you can see in the example from Environment Waikato, they start this by creating a landscape oriented report. Then, they take it to the next level by switching the way the text is printed on multiple pages. This causes the reader to actually change their perspective on the content. When you’re working within a tight budget, commissioning custom illustrations can be pricey. But you can actually use icons to create custom illustrations. Pick icons to make up the pieces of your illustration, then arrange them into a little scene. 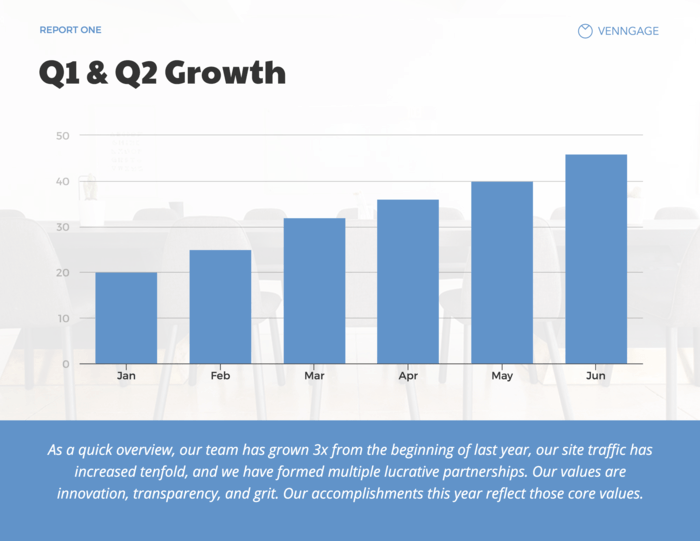 You can use this same tactic when it comes to creating an effective annual report template. Keolis has done this in their annual report design to illustrate statistics. Our post on icon stories will show you exactly when and how to create them. Images and icons are perfect for helping to tell the story of your business’ past year. 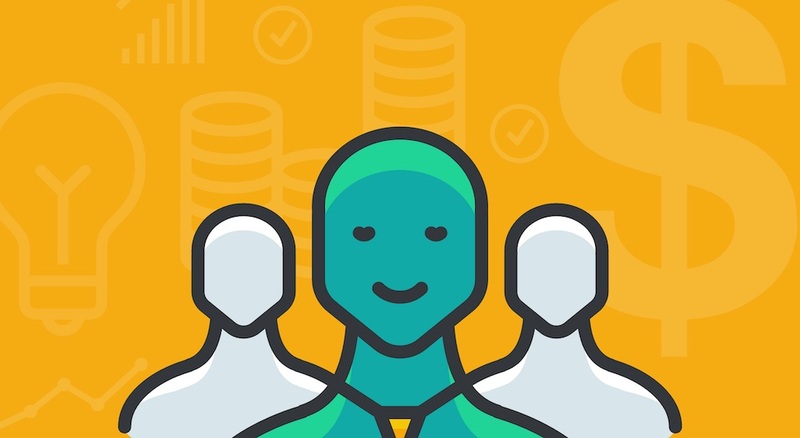 You can actually use icons to create a quirky graphic illustration! In case you haven’t heard this recent graphic design trend, gradients are making a comeback. This isn’t something only hipsters are using–massive companies like Skype and Instagram are embracing the trend too. The Reserve Bank of New Zealand was ahead of the trend when they created their annual report back in 2014. Now it looks right at home in 2018. 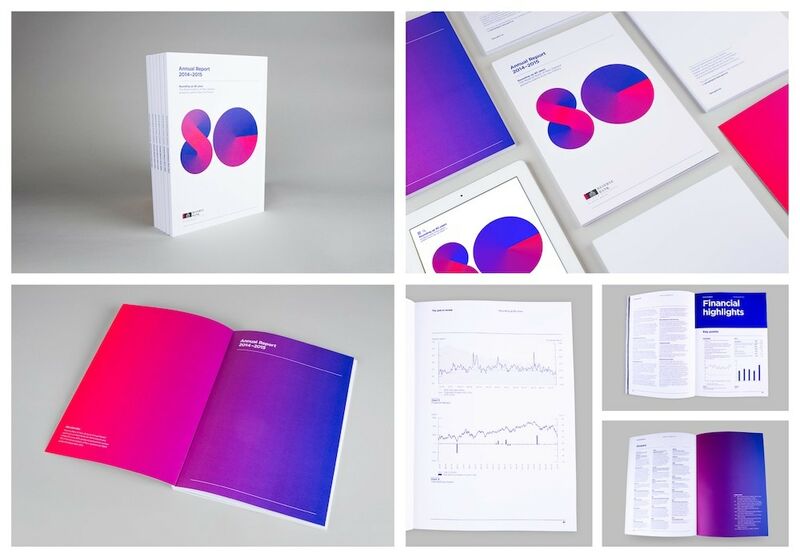 Including a gradient is a unique way to add some bold colors to your annual report template. The color combinations are almost limitless, so your company or organization will definitely be able to find one that works for them. 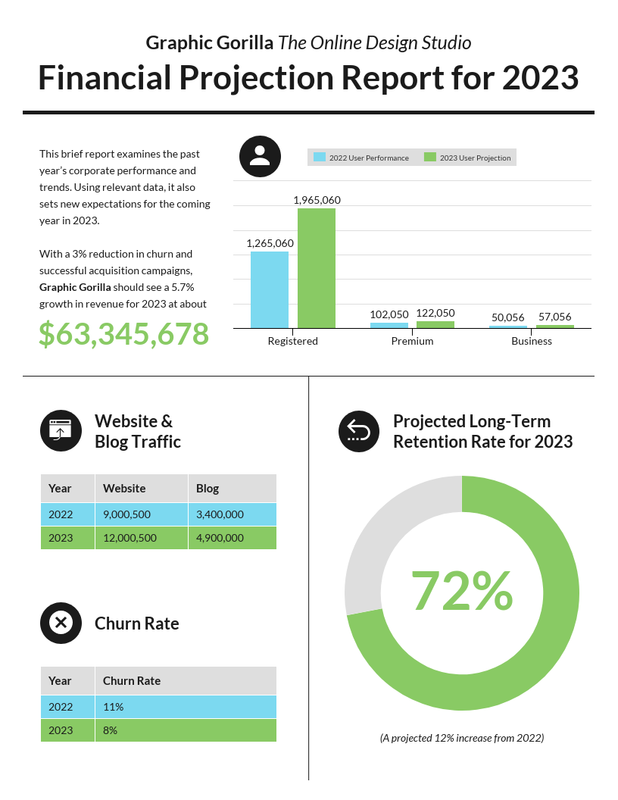 Creating an annual report that your stakeholders or investors will never forget might seem like a lofty goal. But if you make your report interactive, it will certainly stand out. In this annual report example from Craft Victoria, they use their cover to add an extra little surprise for the readers…the cover can be transformed into a tactile experience with small triangular tabs. The triangle motif also carries throughout the rest of their report, making for a cohesive design. Grab readers’ attention with a big, bold header font. While you will probably want to keep the rest of the text in your report relatively simple, your headers are places where you can get more creative. One of the best things you can feature in your annual report template is the people you are impacting. Show your readers how your company or organization has made a difference in the lives of real people. For example, a handful of families that the St. Louis Children’s Hospital supported were featured in this annual report example. Not only does this show that their donors and stakeholders are helping real people with real struggles. They use photos of the families to put faces to the names. You don’t have to use super complex data visualizations to make information engaging–in fact, if you’re not a data visualization expert, you run the risk of confusing your readers. 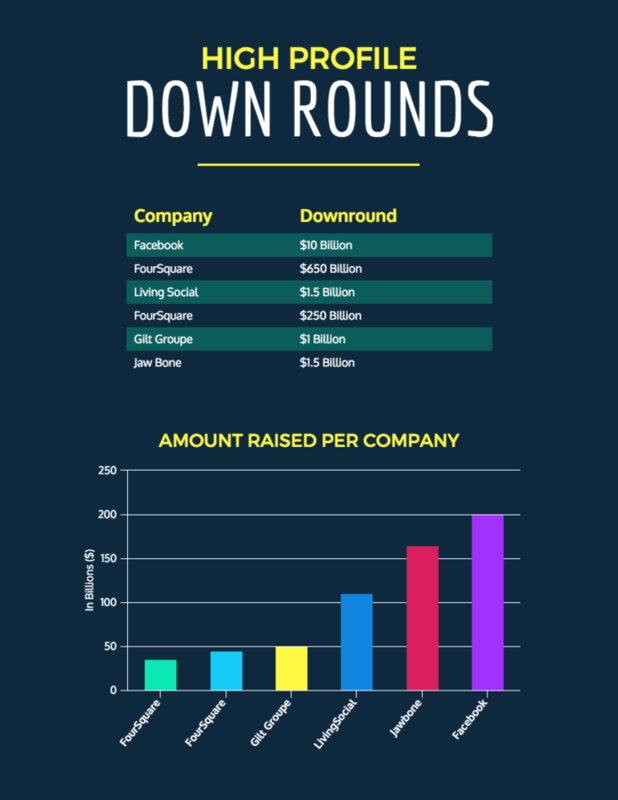 But a simple data visualization can be engaging, and helpful in communicating more clearly. 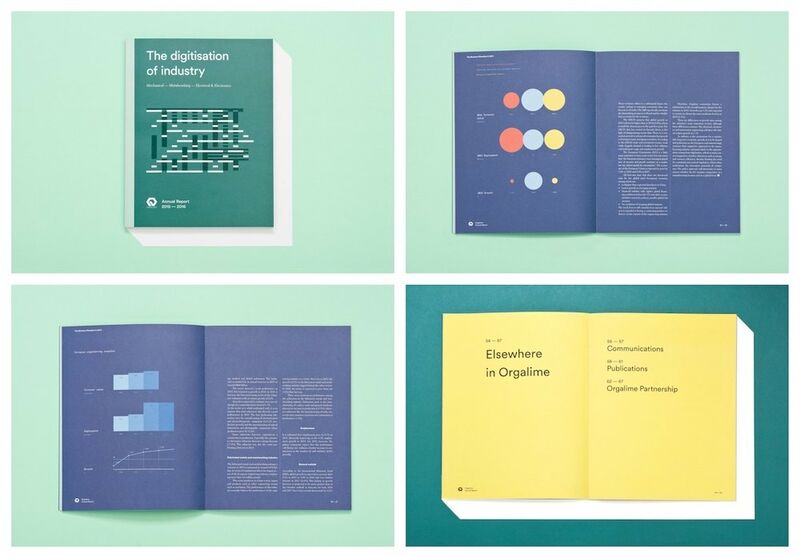 Take a look this annual report from Orgalime, which uses very straightforward but beautiful pie charts and bar graphs. Each example tells you what you need to know and make it easy to compare between data sets. Simple but effective! If you have multiple topics or components that you want to fit together on one page, using borders or block backgrounds can help keep your design organized. 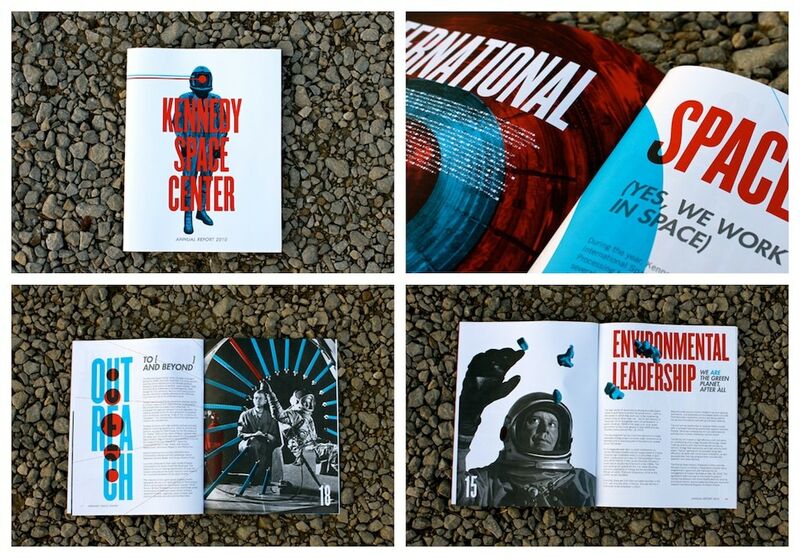 For example, take a look at how RLI Corp uses blocks of bold colors to help each section stand out on the page. This makes it easier for readers to scan the page for different topics. 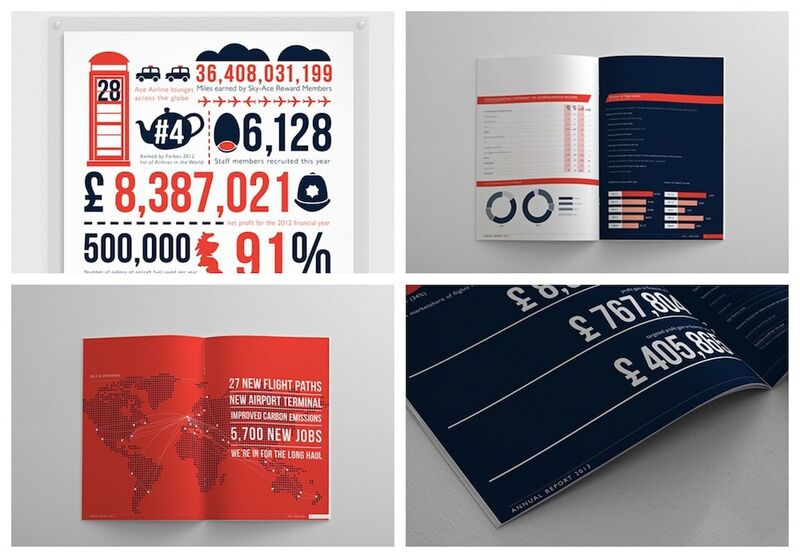 This annual report example from Brunel shows how much impact a confident design motif can have on your design. In this case, they used big, red fonts for all of the headers, with the header text overlapping onto the body text. It’s an unconventional design choice but it works because it’s consistent. If you’re going to use an unusual design motif, commit to it and use it throughout your entire report. At the heart of every business and organization is the people who built it. Help tell the story of these people by using emotionally evocative photos. Everyone probably knows what U-Haul is (if you don’t, they’re a moving company). 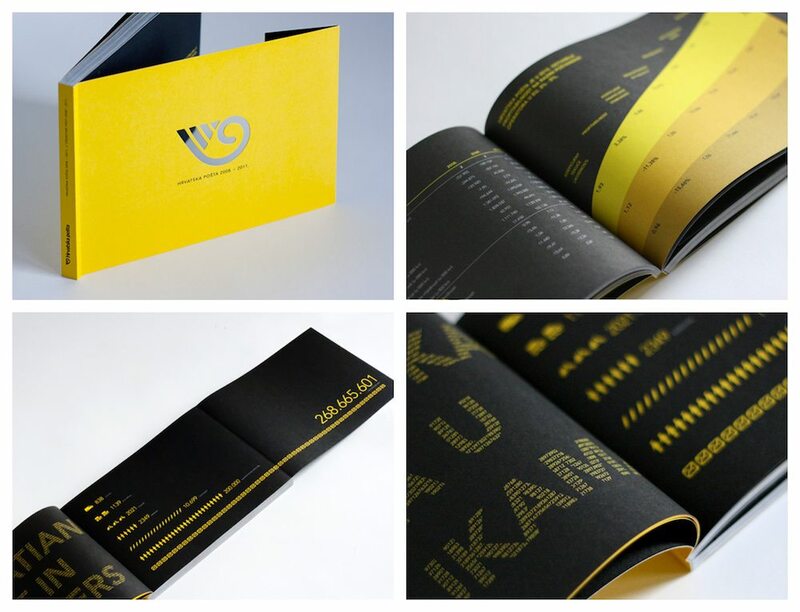 The designer creatively incorporated their business’s service into the annual report design. First, it’s delivered like a package to the reader and it looks exactly like a moving box you would find at one of their stores. Plus, there’s bubble wrap! 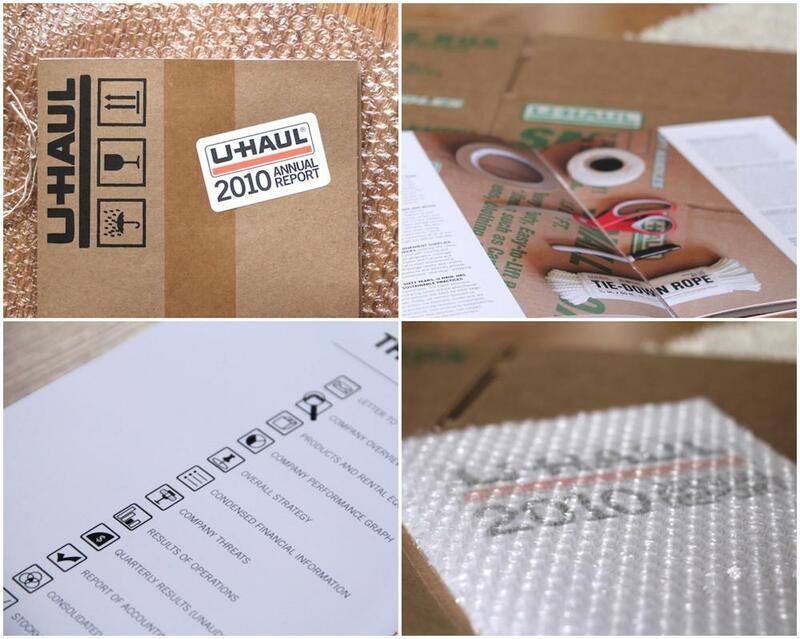 Then the table of contents is modeled after a packing sheet, using the same icons and visuals throughout. Each and every page uses images and visuals that remind people that at the heart of everything, they are a moving company. Visual cues like lines and arrows can improve the flow of your page design immensely. They’re useful for any design project you are working on. 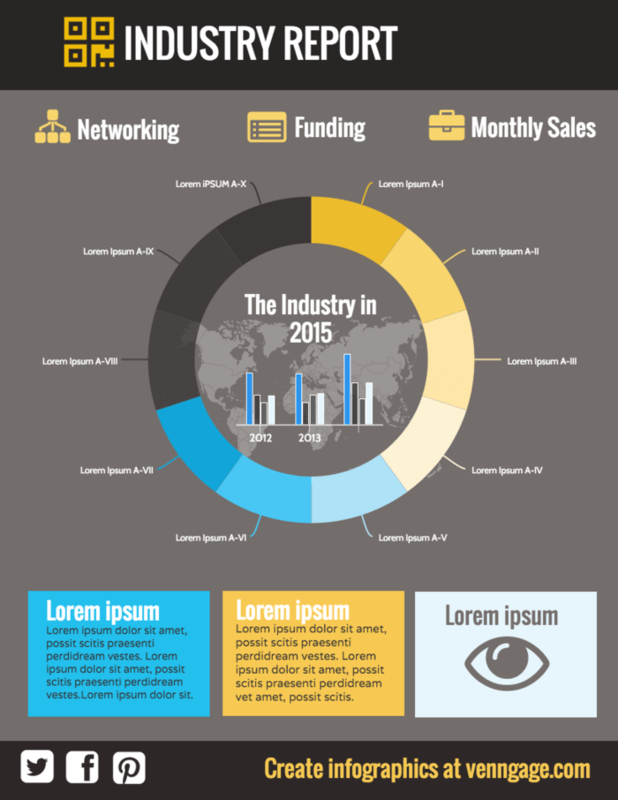 Whether it be an infographic or an annual report template, these subtle lines are a must have. For example, on many pages of this annual report example from Grupo Bimbo they use think lines to direct your eye. These direct readers from point to point on the page–another way to tell stories visually. I know I just said that you should pick a singular theme and stick to it like a few points ago. But for every rule, there are a few exceptions. 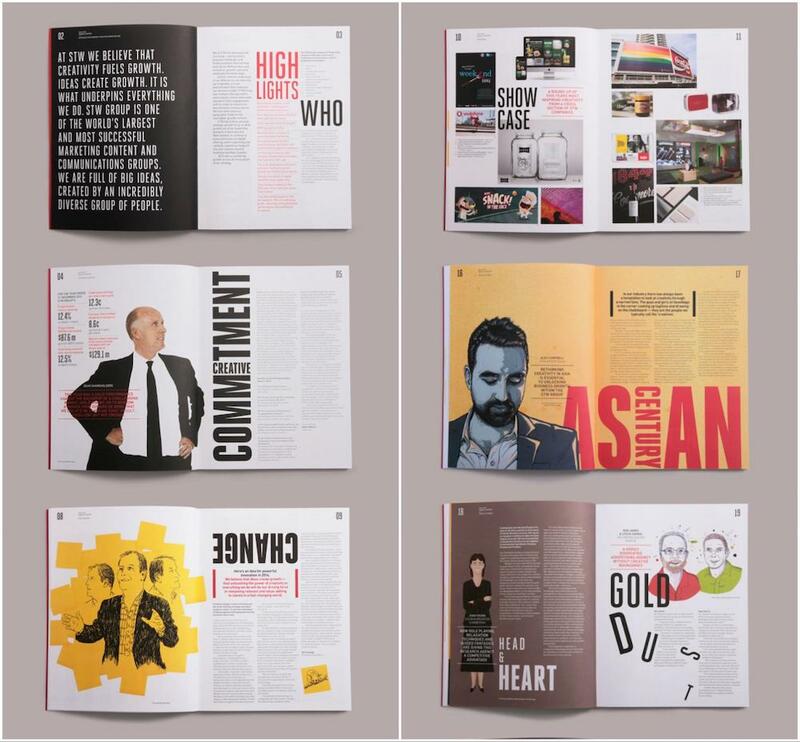 In this annual report example from the STW Group, the theme changed from one page to the next. This can work in an annual report because you’re covering multiple different topics in one document. 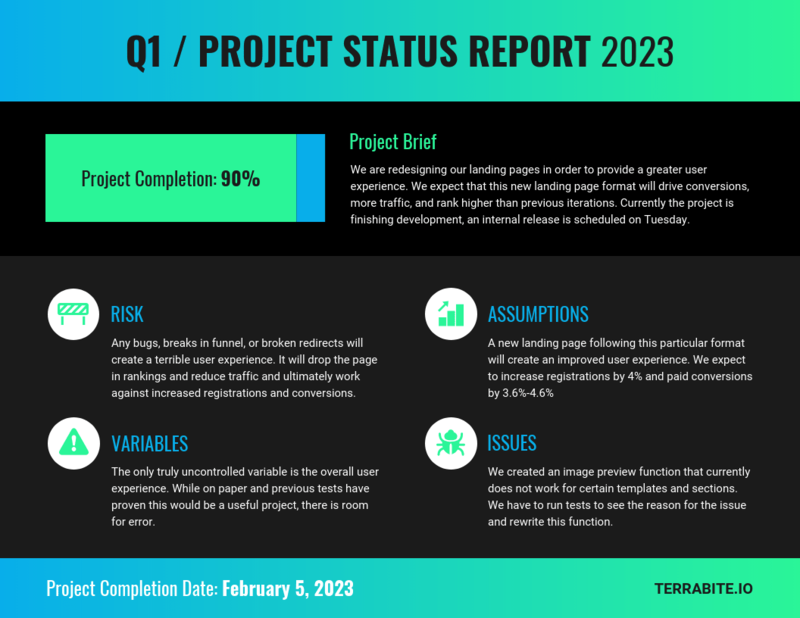 That being said, you should still maintain some consistency throughout your annual report design–like the same color scheme or basic page layouts. Sure, this year may have been a lot of work, but there was some fun had too, right? An annual report is the perfect place to highlight how your business has grown, financially and culturally. Was the year marked by a lot of forward progress? Did you overcome some major obstacles? 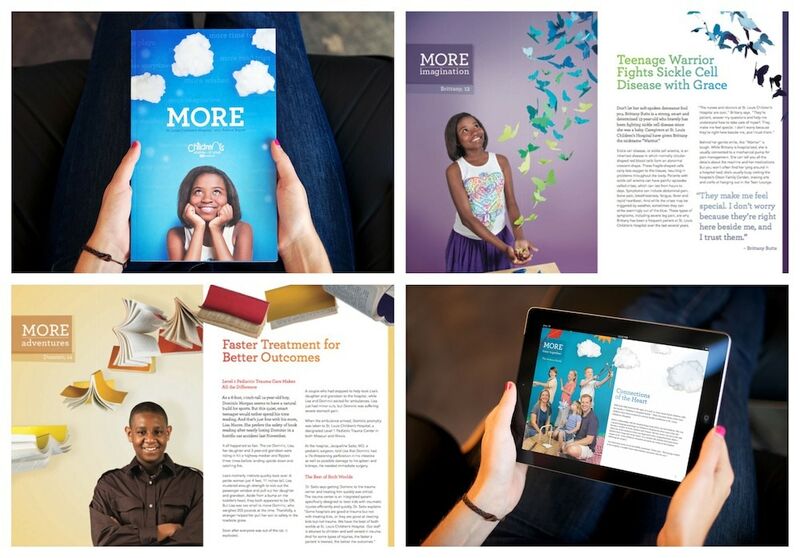 Design an annual report that reflects the year’s overarching theme. In this annual report from Target, they set the tone the first time you look at it. On the front cover they show exactly what the report is going to be all about–freshness. 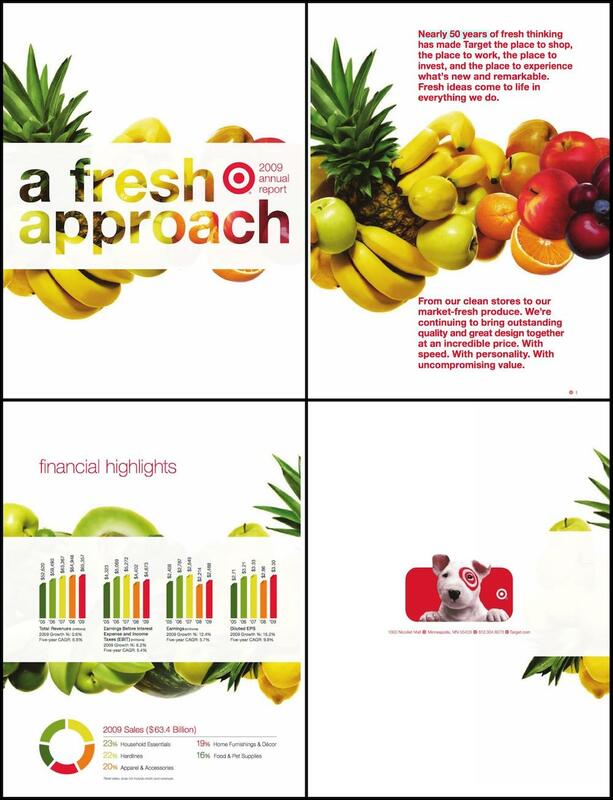 The designers use pictures of fresh fruit and veggies throughout the report to give it a feeling of abundance. This puts the reader in that frame of mind from the beginning, showing them what to expect from the business. Some annual reports take one of their most important values or mission statement and hide it at the bottom of the page. That means most people will skip over it without even noticing! 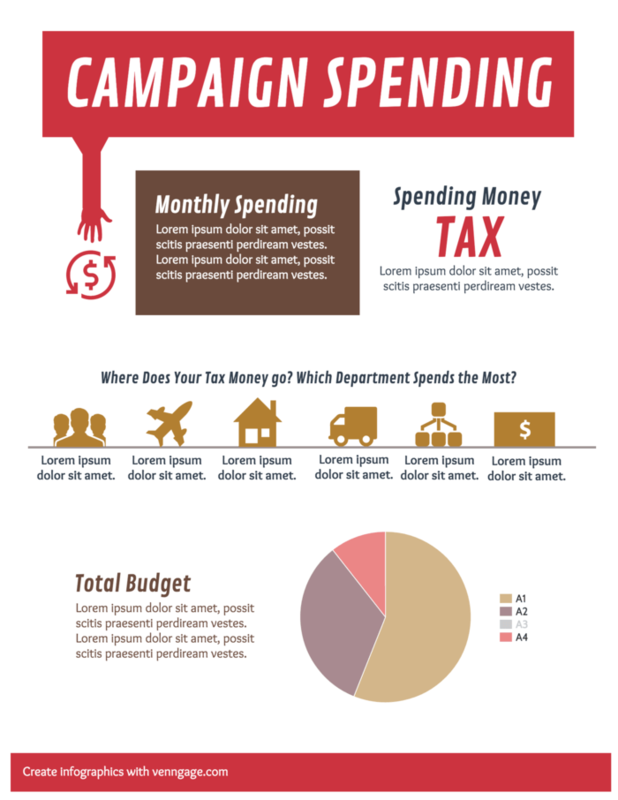 That isn’t the case with this annual report example from PEN Canada. They make sure you can’t miss what they stand for. Each of these pages celebrates a different part of their vision. By using a large bold font they are able to illustrate that they aren’t messing around at all. The contrasting colors make it jump off the page as well. Everything about this annual report from Kennedy Space Center looks like it would be at home in the 1970s. 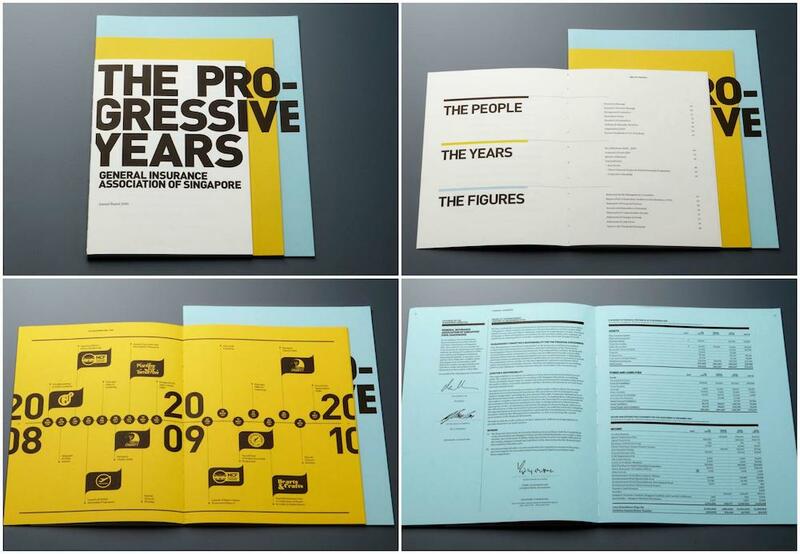 The annual report was published in 2010, but the design calls back to the center’s history–from the color scheme to the retro photos. 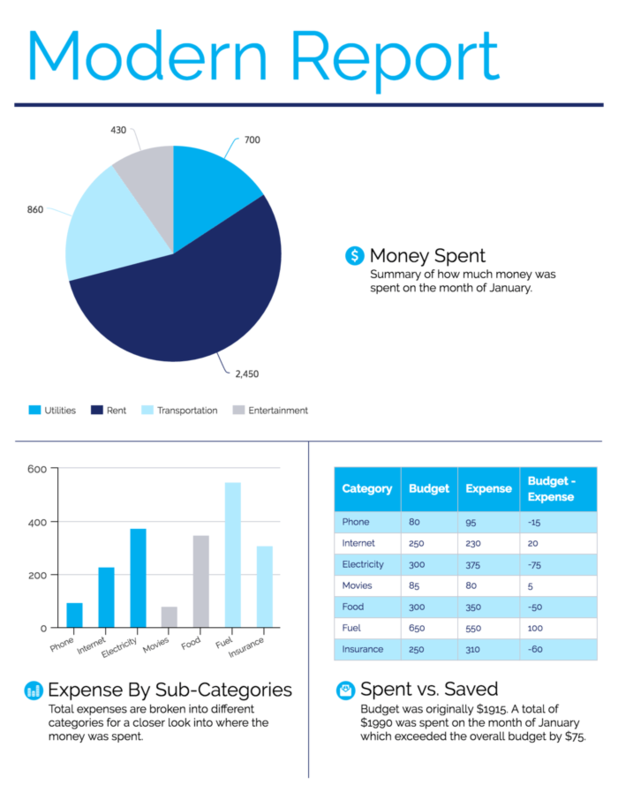 It all comes together to create a fantastic annual report example that NASA enthusiasts will love. Use icons and illustrations to draw the readers’ eyes to certain parts of the page. That could mean including an icon in the page header, using a row of icons to divide off a section of the page, or using illustrations to make concepts easier to understand. This year is all about taking big risks with your design projects. But I wasn’t thinking that would lead to something like ablynx created for their annual report! They decided to go big with their data visualizations, literally. Instead of designing them in a design tool like Venngage, they created them in the real world. 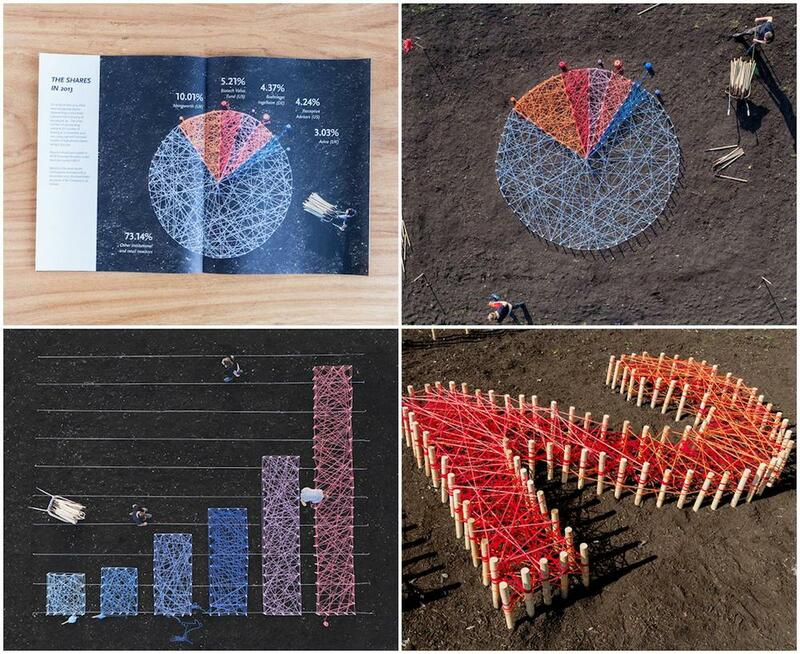 Using sticks, yarn, and earth they build the graphs and charts that will adorn their annual report. This is one of those things that their readers won’t forget anytime soon. Consistency is a basic tenet of good design. But you can find ways to give your designs variety while still maintaining consistency. 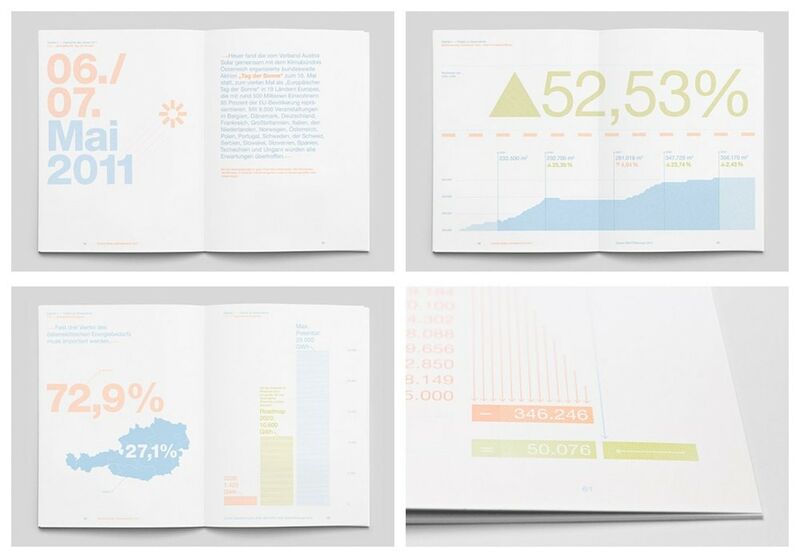 The people at Austria Solar mix up their font sizes and weights in this annual report example. But they still maintain consistency by using the same color scheme throughout the report. Check this guide out if you want to learn more about selecting and using fonts. While tangible reports are nice, more and more people are opting to publish them and read them online. 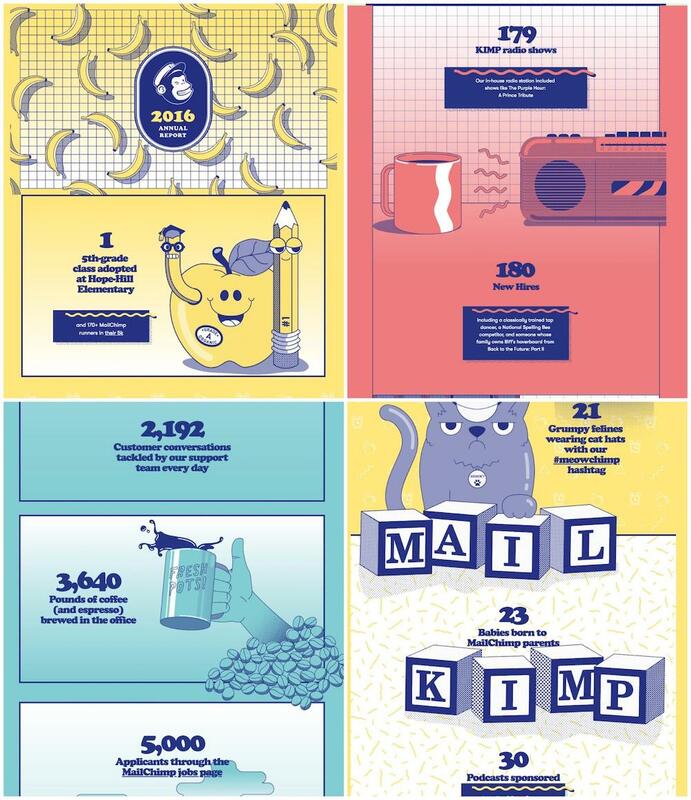 The people over at Mailchimp have been doing this for a few years. 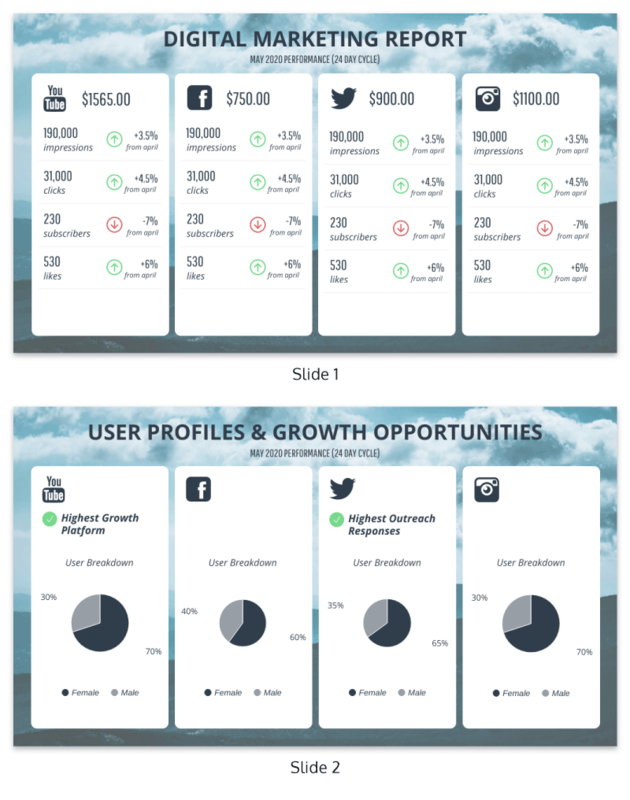 Seeing as they’re a SaaS company, it fits their brand well and allows their report to reach a wider audience. Plus, when you create a virtual annual report you can include things like GIFs, videos and other moving parts! Annual reports have a bunch of different topics to cover. A small thing that you can do to help the reader navigate through the labyrinth of info is to use an intro page. 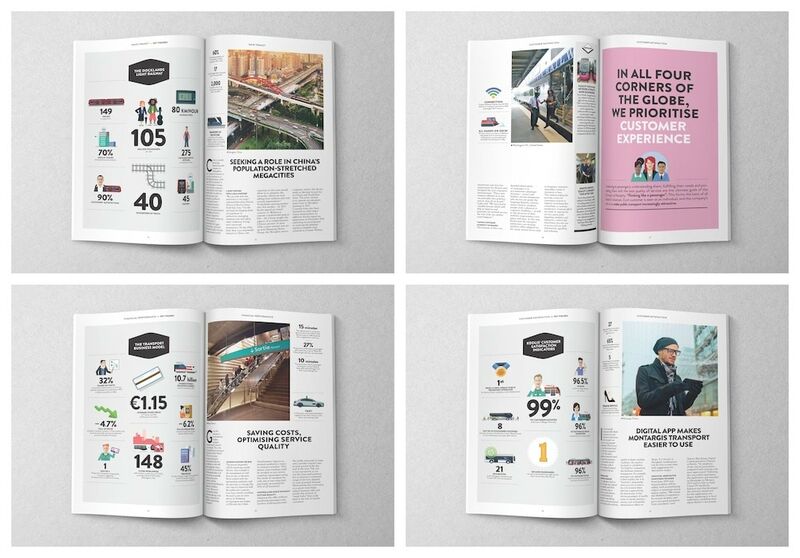 Take a look at what The Warehouse did on a few pages of their annual report. They use an introductory page to lead readers into each new section. A bit of context will give readers a clearer understanding of what the section covers. It could be as simple as a single sentence, or a short paragraph. A common misconception when it comes to minimalist design is that you must only use black, white or neutral colors. But minimalism is all about using the bare essentials when it comes to creating something. There is no rule out there that says you can’t use color–as we can clearly see in this annual report example for a real estate company. The designers used a bold red to bring attention to important charts or trends. Another way to organize your annual report is to differentiate the sections by using different sized paper. In this annual report example from GIA they do just that. When a reader moves from one section to the next they physically have to change the size of paper they are reading. It’s an unexpected and engaging way to frame your different sections. 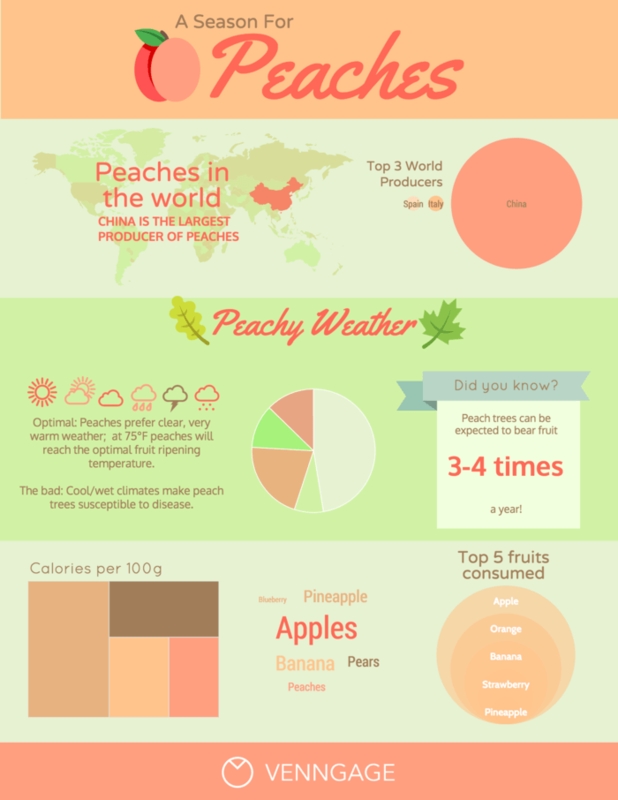 Infographics are great for turning data into engaging visuals that anyone can understand. Plus, there are a ton of ways that you can integrate them into your reports, especially if you mix them with well-designed icons. 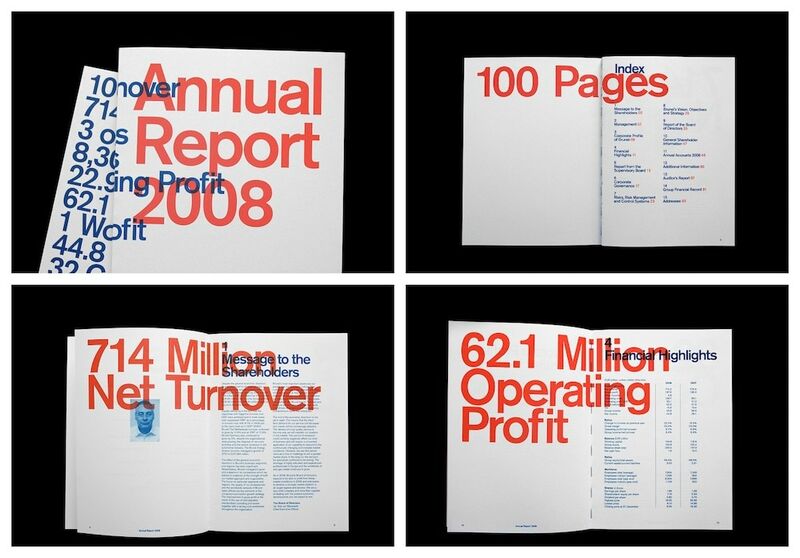 Like the designer behind this real annual report for the fake company Ace Airlines did on multiple pages. 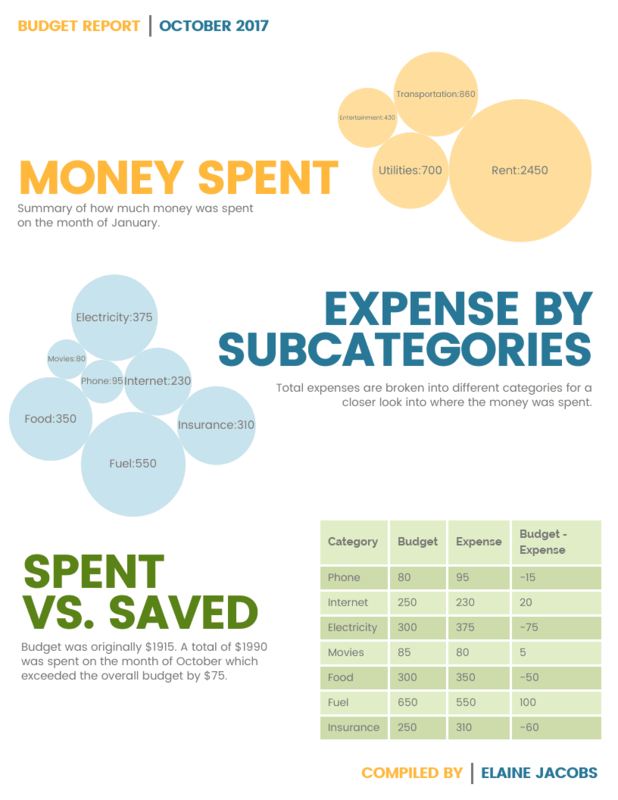 Check out our beginner’s guide to creating infographics. In this annual report example, the designers from BHA took some of their important stats and combined them with icons. Combined with the primary color backgrounds, the design looks modern and in line with current design trends. Additionally, because of the icons they selected, they can prep the reader for what the info is going to be about. 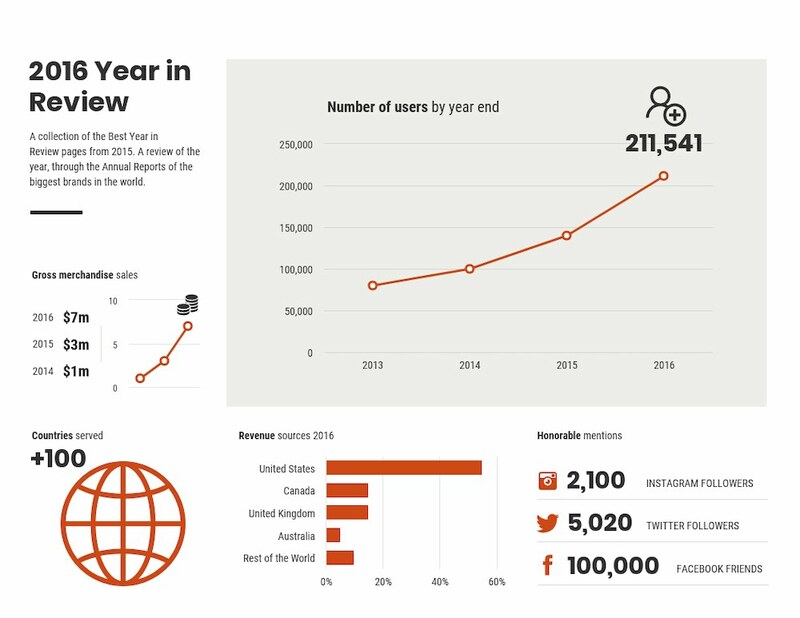 For example, using the microphone icon to show that there were 2.7 million voices behind this annual report.